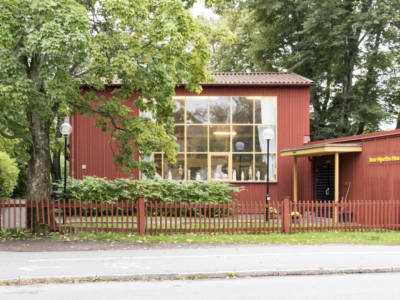 Bror Hjorths Hus is an artist’s museum in Uppsala, housed in Bror Hjorth’s former home and studio. Bror Hjorth lived and work in the house during the last twentyfive years of his life. Ten years after his death in 1968 it was turned into a museum. In addition to Bror Hjorth’s art, the museum presents exhibitions with other artists in an adjacent space. The museum also has a small shop with books, postcards, art supplies and a small café with coffee, tea, biscuits and buns. Bror Hjorth is counted among the finest Swedish artists of the twentieth century. He was a modernist with roots in folk-art, influenced by Egyptian sculpture, cubist painting and primitivism. 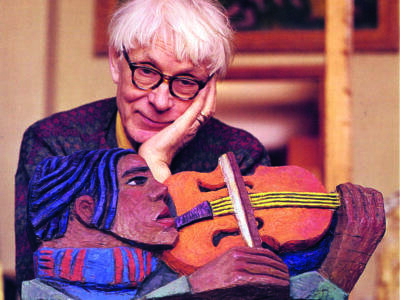 His art is an homage to love, life and music. The museum has the largest and most representative collection of Bror Hjorth’s art. 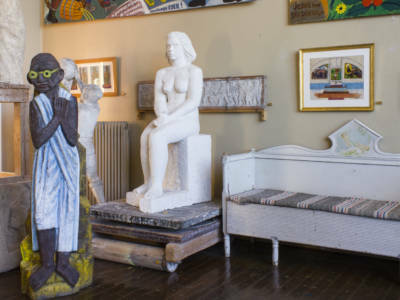 The artist’s works are shown in the studio and home amidst his books and furniture. This contributes to an intimate and personal experience of art and an understanding of the artist’s conditions. Paintings, sculptures, reliefs and drawings fill the walls and floors and it is sometimes possible to follow a work from preliminary sketches to finished creation. The museum staff is there for you and will gladly provide you with information on Bror Hjorth and the artworks. Whether you come to see Bror Hjorth’s art, any of the temporary exhibitions in the art gallery, attend art school or listen to a lecture or concert, we hope you leave Bror Hjorths Hus with a feeling that you have experienced something unique.